Neo-Tokyo has risen from the ashes of World War III to become a dark and dangerous megalopolis infested with gangs and terrorists. The government maintains only a token control over the powerful military that prevents total chaos and hides the secrets of the past. Childhood friends Tetsuo and Kaneda plunge into Neo-Tokyo's darkest secret when their motorcycle gang encounters a military operation to retrieve an escaped experimental subject. Tetsuo, captured by the military, is subjected to experiments that make him a powerful psychic, but his powers rage out of control and he lashes out at the world that has oppressed him. Nothing can stop the destructive forces that Tetsuo wields except possibly the last boy to destroy Tokyo - Akira! Japanese director Katsuhiro Otomo's landmark anime feature is available in an eye-popping new restoration. DVD: Widescreen 1.78:1/16x9; audio English Dolby Digital 5.1, Japanese Dolby Surround 2.0; THX; subtitles English; closed-captioned; single sided - dual layered; 36 chapters; rated R; 124 min. ; $39.98; street date 7/24/01. Supplements: Capsule Option - English Translation of Graffiti; Akira Production Report; Akira Sound Clip by Geinoh Yamashiro Gumi; Interview of Director Katsuhiro Otomo; Over 4500 Stills of Production Materials; Over 100 Stills of Akira Glossary; Original Teasers and Trailers; Interviews of Restoration Staff; THX Optimode. After my experience with 1999’s Princess Mononoke, I was reluctant to visit any other anime titles. Although I thought PM was a reasonably entertaining flick, I couldn’t comprehend the enormous respect and admiration it engendered. As such, I was reluctant to check out 1988’s Akira. If anything, this landmark film boasts a fanbase larger and more fervent than that of PM. I got enough nasty e-mails when I failed to gush over that latter flick; I was not eager to repeat that experience if I didn’t care for Akira. Happily, I hope my thoughts here will not be seen as cause for attacks upon my perceptions. While Akira wasn’t a film that I found to be exceedingly memorable, I felt it worked well and it offered an unusual and stimulating experience. The storyline of Akira could become rather convoluted, but here it is in a nutshell. Set in Japan, the film takes place in 2019. An apparent nuclear blast leveled Tokyo about 30 years earlier, and a new city has grown on top of it. One feature of Neo Tokyo is its motorcycle gangs who fight in the streets, and from one of those groups comes our main characters. Kaneda leads the group, and Tetsuo is the fairly-nerdy one who has lived in his shadows for years. Early in the movie, we see a battle between this gang and their main rivals, the Clowns. In the midst of this mêlée, an oddly-aged child named Takashi appears, and some powerful governmental forces swoop down to recapture him; he’d been freed from a research facility by underground elements who want to overthrow the government. During the uproar, Tetsuo scares Takashi, and the boy uses some spooky mental powers to trash Tetsuo’s bike and also injure him. When the powers-that-be grab Takashi, they also snag Tetsuo for good measure. From there a dual storyline begins. On one hand, Kaneda tries to find and rescue Tetsuo, an endeavor that involves him with activist Kei, a woman who is sufficiently-attractive to catch his eye. On the other, we discover what happens to Tetsuo himself. Apparently via the interaction with Takashi, Tetsuo develops powerful psychic abilities that can be used for his own ends, though he doesn’t have much control over them. “Vast powers” mixed with “low self-esteem” create a nasty combination, and Tetsuo quickly gives in to the dark side, as it were. Kaneda, Kei, and the government forces all have to mobilize to halt Tetsuo’s impending rampage, one that might destroy Tokyo all over again. At times, the storyline to Akira can be somewhat befuddling for a neophyte such as myself. While the blame for this ultimately falls upon the filmmakers, it turns out that there’s actually a very good reason for the semi- confusion. Akira was adapted from comic books, and apparently the movie’s creators assumed that its viewers would already be familiar with its world. It’s a credit to the quality of Akira that it works well even without that knowledge, but I do feel it probably would be more effective for folks who already have some familiarity with its workings. In any case, the story functioned on a variety of levels, and for one’s first viewing, the simply action elements were strong enough to make the flick seem intriguing. One nice aspect of the tale stemmed from the complexity of the characters. They felt like reasonably real people, at least once one accounts for the odd sci-fi nature of their world. Although the movie appeared to function on a simple “good vs. bad” level, the truth was that all of the characters betrayed sufficient depth to prevent such basic generalizations. No one was pure and perfect, while no one else was totally dark and malevolent. To be certain, we’re supposed to side with Kaneda, but even he had definite flaws, all of which became more evident as the film progressed. Another striking aspect of Akira stemmed from its stunning visuals. Clearly Blade Runner strongly influenced Akira; I don’t think the fact both take place in 2019 was a coincidence, and the two movies showed similar stylistic elements. However, Akira created a nice environment of its own, and the clean and well-realized images made it all the more involving and compelling. One of my biggest complaints about the few examples of anime I’ve seen relates to the animation. These films lack much fluidity, and they often show jarring and unrealistic movement. While Akira doesn’t approach Disney-esque heights in this regard, it offers a much smoother and realistic vision that I expected. The flair seen in the rest of the film also probably distracted me from the animation’s awkward aspects; unlike with Princess Mononoke, I was interested enough in the tale and the events that I didn’t focus on the visual flaws. Speaking of Disney, I believe that one of their recent films offered a subtle Akira reference. One of its minor characters is a holy man who has a big puff of hair and wears sunglasses. In 2000’s The Emperor’s New Groove, we see a little entertainer who bears a remarkable resemblance to the Akira character. Coincidence? Not a chance - clearly this was a small bit of fun from the boys at Disney. That reference marks the only similarity between Akira and the fare promoted by Disney. While I love much of the Disney oeuvre, there’s no question that they would never put out something as violent as Akira, and that’s fine; there’s no need for them to do so. While I doubt that Akira will make me a fan of anime, I nonetheless felt it was a thoughtful, rich and compelling experience that seems to stand as some of the best work found in the genre. 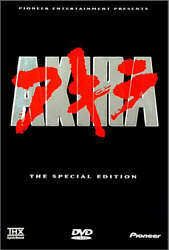 Akira appears in an aspect ratio of approximately 1.78:1 on this single-sided, dual-layered DVD; the image has been enhanced for 16X9 televisions. While some small problems appeared throughout the film, as a whole I thought the DVD offered a very pleasing picture. Sharpness consistently appeared solid. Very few examples of softness occurred, as the image remained detailed and accurate during the majority of the film. This occurred with no discernible examples of moiré effects or jagged edges, but I did witness some minor edge enhancement at times. Print flaws also presented a modest concern. A little grain interfered with the picture on occasion, and some dust from the original artwork was periodically evident. In addition, a few examples of speckles and grit appeared from time to time. However, no more significant defects such as scratches, tears, or blotches marred the image; it remained fairly clean and fresh through most of the film. Akira featured a nicely varied palette, and the DVD replicated these hues well. Reds dominated the affair, and they came across as deep and rich, with no bleeding or noise attached to them. Cityscapes provided the most dazzling hues, as those shots appeared very lush and brilliant. Black levels also seemed dense and dark, and shadow detail was appropriately heavy but not excessively opaque. A few low-light sequences could have offered better definition, but the majority of them provided solid clarity. Ultimately, Akira was a fine-looking DVD that should please its fans. The situation became more complicated when I assessed the soundtracks found on the Akira DVD. The disc offers both the original Japanese mix and an English dub, which makes perfect sense to me. In a case such as Princess Mononoke, comparisons were simple; both the English and the Japanese tracks sounded virtually identical. That definitely wasn’t the case for Akira. For one, the formats used for the two mixes differed. The Japanese version appeared as the original Dolby Surround 2.0, while the English dub featured a new Dolby Digital 5.1 track. When compared, the mixes revealed that the distinctions between the two encompassed more than the sound format; although much of the time they seemed to be fairly similar, quite a few strong alterations were made to the 5.1 track. First I’ll cover the Japanese mix, and then I’ll go over the differences heard on the English dub. For a somewhat older movie, I thought the audio heard on Akira sounded pretty solid. The soundfield favored the forward spectrum, but it added a fair amount of life through all of the channels. The front side speakers contributed some positive atmosphere and sounds panned favorably across them. Music seemed to offer decent stereo separation, and the surrounds contributed a good sense of reinforcement. During some louder scenes, the rears really came to life pretty nicely; for example, when helicopters were involved, they moved well across the speakers and they were accurately placed within the environment. I also liked the psychotic pinging effect heard when Tetsuo first encounters the giant stuffed animals. Audio quality seemed to be a bit erratic, but I thought the movie generally sounded good. Since I don’t speak Japanese, I can’t judge the intelligibility of the dialogue, but I thought that the lines seemed to be reasonably warm and natural, and they displayed no problems related to edginess. Dialogue blended well with the action, especially since pains seem to have been taken to make those elements fit; ambient effects placed speech neatly within the track. Music could be a little flat at times, but much of the score demonstrated solid dynamics. Bass response was a bit loose, but low-end came across as reasonably loud and forceful when I heard the music. The score would have benefited from greater dynamics, but I thought it featured positive fidelity. The effects offered the weakest link in this auditory chain. Though they usually displayed acceptable accuracy and clarity, they could appear to be somewhat thin and bland at times. The range simply wasn’t there to make these elements really come to life, and though the surround track let them breath fairly well, the dynamics made them seem a bit wan. Some louder effects also betrayed minor distortion at times. Nonetheless, when I consider the age of the material, the Japanese soundtrack of Akira provided a reasonably satisfying experience. Objectively, the English Dolby Digital 5.1 mix was a much stronger affair. My biggest complaint about the Japanese track related to the dynamics, and the English dub largely fixed that problem. Though some musical elements actually provided stronger bass during the Japanese version, as a whole the English one offered a brighter, cleaner, and deeper track that created a more involving and exciting piece. However, not everything favored the English track. Poor dubbing is often the Achilles’ heel of foreign films, and that problem affected Akira. I didn’t think the insertion of English speech was poor, as I’ve definitely heard much worse. Nonetheless, the dialogue often did not fit well, and this became a distraction. Mouth movements appeared awkward, and the Japanese lines simply demonstrated a more natural air. The sound designers of the original mix created a lifelike atmosphere around the speech that doesn’t exist on the English track. As such, those lines came across as more sterile and artificial. It didn’t help that some of the English voice acting seemed to be fairly weak. In general, there’s a campy tone to these tracks that makes them less involving, and that occurred here. Japanese flicks often feature an overemphasis on lines that seems to work in their original language but doesn’t translate well to English; as a result, the words become overacted and silly. Most of the English actors matched the originals fairly well, however, with only a few exceptions. The voice for Kiyoko created the most noticeable - and irritating - difference; while the Japanese version used an actual little girl in the part, it sounded as though the English one featured an adult who pretended to be a kid. That seemed odd, since the other children heard on the English track appeared to be real kids, not adults with high voices, though I could be wrong; it’s possible they were also adults, but they were simply better actors than the woman who played Kiyoko. The English 5.1 track also clearly altered some parts of the original mix. For the most part, the same stems appeared to have been used; I could even hear identical distortion for some elements. However, it was obvious that they “beefed up” parts of the English mix. For example, check out a scene in which a large door moved; it can be found around the 39:40 mark. In the Japanese version, this occurred almost silently, but the English track added a deep rumble to the event. Frankly, I thought the English audio made more sense in this instance, but some will find this alteration to be distracting and unnecessary. The English track also removed some audio heard on the original Japanese mix. For many “meeting” scenes of the city governors, lots of chatter would appear in the side and rear channels. This totally vanished for most of the English version. While the English edition added more than it removed, it clearly did drop some elements of the original track. Frankly, I can’t clearly establish which soundtrack I preferred. If I were to watch Akira again, I’d probably select the original Japanese mix. It worked fairly well, and it offered a more natural presentation. However, I’d find it hard to resist the superior dynamics of the English edition, especially since I really dislike subtitles; it’d be nice to dispense with them. Ultimately, this will remain a personal choice, and I’m happy to report that both soundtracks were generally positive. Usually English dubbed tracks are so weak that the option is completely clear, so I like the fact that Akira offered two viable selections. In this two-DVD special edition of Akira, we’ll encounter a slew of supplements, almost all of which appear on the second disc. DVD One tosses in an unusual subtitle feature. If you activate the Capsule Option, you can access translations of most of the Japanese text seen in the movie. When a “capsule” icon appears onscreen, press your remote’s “Enter” button and the DVD will display the English version. While this was a cool idea, I thought the execution hampered it. Frankly, it got old after a while; I found it annoying to frequently have to hit “Enter” just to read a couple of translated words. This would have worked better if it could have been set to operate automatically. I see no reason why the DVD couldn’t have consistently displayed the text without intervention. In any case, it’s still a thoughtful addition. The only other extra on DVD One was the THX Optimode program. As also found on other DVDs like Cast Away and Die Hard 2, this is supposed to be used to set up your home theater to best present the movie on the disc in question. Apparently the Optimode is unique for each DVD on which it’s included; unlike programs such as Video Essentials, the Optimode should tweak your set-up differently every time. Frankly, I’ve been very happy with my already-established calibration and I’m afraid to muck with it, so I’ve never tried the Optimode. If you lack calibration from Video Essentials or a similar program, or if you’re just more adventurous than I, the Optimode could be a helpful addition. Now we move on to DVD Two, where we’ll encounter the lion’s share of supplements. First up is the Production Report. Created in 1988, this video program includes 10 subsections, each of which can be viewed individually or as a whole via the “Play All” option. It can be screened with or without English subtitles, and the entire package runs for 48 minutes and 10 seconds. Although the “Production Report” lasts much longer than the average featurette, it really doesn’t provide much greater depth than you’d find in the average ten-minute piece. On the positive side, we do get to meet some of the team that put together Akira, and we also see how much of the work was accomplished. However, the tone remained hyperbolic and promotional, largely due to an overzealous narrator who spouted inanities like, “Wow! That’s great!” The program also lacked much depth, and it offered a generally superficial look at the making of the film. I enjoyed parts of the show, but much of it was too thin to merit much praise. Next we find Akira Sound Clip, a program that covers the film’s music. This piece includes seven chapters and lasts a total of 19 minutes and 15 seconds. It can be viewed with or without English narration. While this featurette offered some good notes about how the movie’s creative score was made, as a whole it could be a little dull. The details only appeared periodically, as much of the “Sound Clip” simply provided film segments and their musical accompaniment. The program merits a look to gather a little additional information about this field, but I thought it was a disappointment. Another video piece provides a Director’s Interview. Created for a 1993 laserdisc release, this program lasts for 28 minutes and 55 seconds. It appears in Japanese with optional English subtitles. As a whole it mainly offers “talking head” shots of director Katsuhiro Otomo, but it also has a few film clips and some behind the scenes material. Overall, it was a fairly dry effort that did not feature a lot of depth, although it did provide a decent discussion of how Otomo started in the business, the origins of Akira and the filmmaking process. It wasn’t fascinating material, but it seemed to be interesting enough to merit a look. Production Materials is the place where Akira fans will be occupied until 2019. This area includes an extraordinary wealth of stillframe pieces. From storyboards to production art to character design, this department strongly documents the creation of Akira and it should delight the movie’s biggest partisans. As for those with a weaker tie to the film, it should be something they’ll browse through, but I doubt they’ll get as much from it. Nonetheless, I love the completeness of the area and really appreciate the depth of the extras. The “Production Materials” area mainly follows the chapters of the DVD. As such, the first 36 different areas of this section correspond to those parts of the film; this was a nice touch that makes it easier for us to quickly skip to the desired scenes. In addition, the “Other” portion of “Production Materials” goes over “Unused Storyboards”, “Unused Backgrounds”, “Initial Character Design”, “Comics and Magazines”, “Movie and Promotion”, and “VHS, CD and Miscellaneous”. These sections were of the greatest interest to a modest fan like myself. I appreciated the detail of the first 36 sections, but they were simply too much for me; I love the fact they’re there, but I don’t care enough about them to get much from them. However, most of the “Other” pieces were fun, mainly because they lacked the technical orientation of the prior segments. The “Unused Storyboards” were less exciting because I couldn’t read the Japanese text; this meant that I didn’t understand much about the scenes. Still, I liked the pieces that fell in the last three categories, as it was fun to see promotional bits and other things related to Akira. For the record, the 42 different “Production Materials” sections included between 11 (“Unused Backgrounds”) and 332 (“Unused Storyboards”) frames of work. All told, this added up to a whopping 4564 bits! Normally I count these pieces myself, usually because most DVDs don’t list the exact numbers. Even when they do provide this kind of information - such as featurette running times - I prefer to confirm these things myself because the DVDs sometimes provide incorrect data. However, in this case, I’m going on faith. The folks at Pioneer were nice enough to provide figures inside the DVD booklet, and I would prefer to trust them rather than attempt to count the frames and go insane. Well, at least I summed up the numbers they provided; when confronted with such a vast collection, I was tempted just to relate that the DVD included “a bunch” of stills. Trailers provides five different advertisements. There are two “Special Announcements” - which seem to equate to what we’d call “teasers” - plus two full trailers and one TV ad. These can be viewed with or without English subtitles. Frankly, you may want to skip the translations, as they make the ads appear awfully silly. For example, “Special Announcement Two” offers these statements: “Martial law declared! Exploding energy! The year’s most talked-about ‘dangerous movie!’” Well, I suppose our ads probably look silly to the Japanese. Restoration includes three featurettes that detail the recent reinvigoration given to Akira. We learn about the work done to the “Picture” (four minutes), “English Voice-Over” (three minutes, 10 seconds) and “English 5.1 Audio Mix” (three minutes, 20 seconds). These pieces provide comments from the folks involved in the various steps, and we also see some examples of their work. Overall, these were minor pieces, but they gave me a decent look at the processes used to prepare Akira for its theatrical re-release and its DVD appearance. This area also contributed “Credits” for the package. Last but certainly not least, we discover a Glossary that works as an index for characters, objects, places, events and situations seen in Akira. For those of us who weren’t already familiar with the film’s world, this section was a godsend. It helped fill in some of the gaps after I watched the movie, and it really was a solid and useful piece of work. It also added some material that we don’t learn in the flick, such as backgrounds, ages, and others factoids. The “Glossary” wasn’t the flashiest extra on the DVD, but it may be the most useful. Although I can’t say I’m a big fan of anime, I do understand why fans of Akira enjoy it. The movie presents a rich and compelling experience that seems likely to only get better with repeated viewings. As for the DVD, it offers very solid picture and sound plus a wealth of extras that should interest and delight partisans. All in all, the special edition DVD of Akira is a fine package. Anyone who already likes the film will probably be very happy with this set, and those who wonder what all the fuss is about are also encouraged to give it a look. One final note about this package: I reviewed the Akira special edition in the “limited edition metal collector’s case”. Apparently this packaging is restricted to the first 100,000 copies of the Akira SE to sell. After that, the SE will still be available, but it will be in different casing. However, the timing of that release remains confusing. On one hand, I’ve heard some reports that once the LE tin sells out, the DVD will simply be issued in normal packaging; there will be no distinct release date for the latter. On the other hand, I’ve also seen reports that the standard SE won’t appear until September 2001, which might mean a brief period during which no SE copies of Akira would be available. My feeling is that the first reports are correct. My press release makes no mention of the LE tin; it simply states that the SE will appear on July 24, and that’s that. As such, I think that once the tins are gone, stores will just stock the “ordinary” SE without any interruption. In addition, a bare-bones “movie-only” release of Akira accompanies the SE; it apparently includes none of the SE’s features, and it lists for $24.98.